In this instance, I believe you've misinterpreted the definition of ricer as a reference to people of Asian heritage. That's not the definition in this context. A Ricer is someone who mods up a car, usually lesser expensive cars, but mods them none-the-less. In another thread someone referred to the 19" wheels as Ricer Wheels. Jokingly, I said I must be guilty as charged and laughingly referred to myself as "Ricer Rod." I know you don't know me, but I couldn't be further from having ANY racial bias. I'm a gay Jewish man, who is beyond liberal. I hate what is happening in our country at this time. I posted a comment in the pics section. Congrats though, lovely car and the leather/wood combo is perfect. I'm glad you're chuffed about your new wheels. Happy motoring and post some more pics when you get a chance. Thanks so much. I'll post more pics after she gets her first coat of wax this weekend. Maybe break out the Nikon DSLR! At long last the wait is over! To say I'm thrilled is an understatement. Got to the dealership at about 3 this afternoon for a scheduled delivery at 3:30. The paperwork was ready the car was ready and everything went so smoothly. The Concierge lady who helped get everything set up was simply amazing. 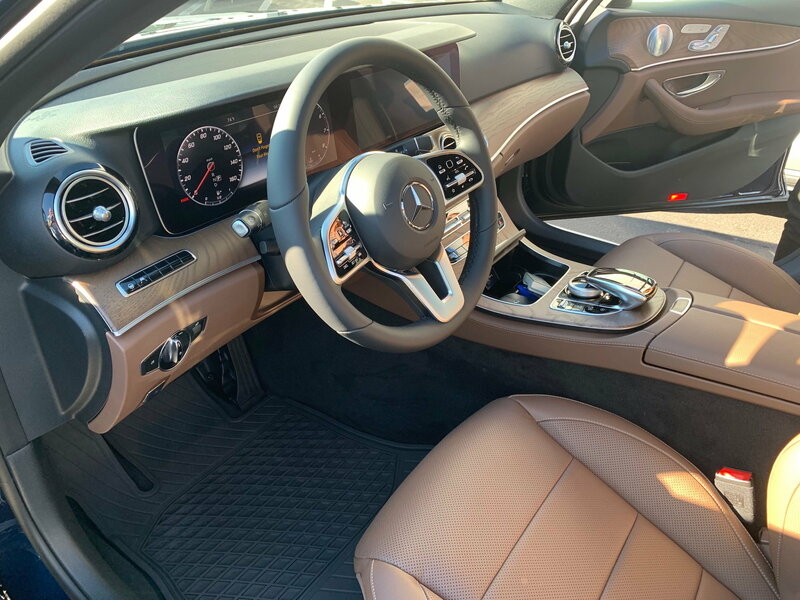 Even though I know how to use most settings, she taught me things I didn't know, she input my radio stations, she got me all connected with the new Mercedes Me Connect, which is totally different than Mercedes Me and provides a lot more information, including gas level, etc. Also of interest is that Mercedes is now partnered with AT&T for Internet service in the 2019 cars. Since I am already an AT&T customer, my car internet service will be billed to my cell phone account and not be tied to Mercedes at all. I imagine this will be a good thing as the Mercedes internet services were spotty at best. Unlimited data is $20/month. I haven't had much time behind the wheel, but what time I have had was terrific. 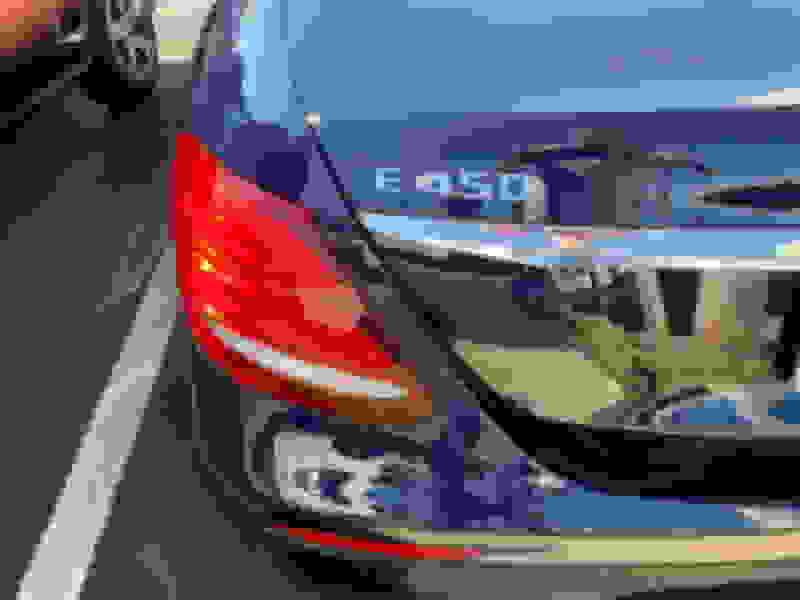 I truly didn't think I would be able to discern any difference between the E400 and E450, but there is a real difference. Acceleration is stronger and the car just feels more potent. For whatever reason, maybe just because the odometer came with just 9 miles, it feels more solid. I love the new steering wheel. You can do virtually everything you want including engaging Distronic cruise control from the buttons on the wheel. The cruise control stalk is now gone, YAY! You just have the turn signal/wiper stalk and the electric stalk for adjusting the height and depth of the steering wheel on the left. I'm sure many will remember me saying I didn't think there's anything wrong with the analog instruments and I still believe that, BUT man oh man, the digital instrument cluster takes things to a new level. I'm currently using the Progressing display, which let's me put navigation on the right and the odometer on the left. So so so COOL! Thanks for all the friendships this forum has helped form over the last several months. For those still waiting for your new cars, the wait will SO be worth it! And now the requisite pictures taken with my iPhone. Oh and on that. I'm beyond happy to say the charging mat has been made bigger. My iPhone X barely fit the E400 or E300. My iPhone Xs Max WITH a case sits completely flat on the charging mat! Really Nice! 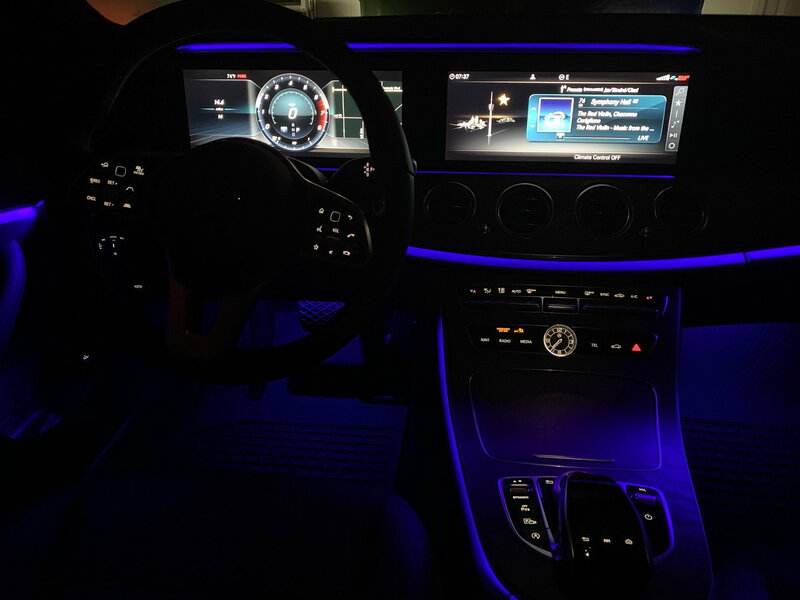 Congrats on your gorgeous new ride, and thanks for the pics and insights into new features. Seems like so many of us have been anticipating its arrival right along with you. Great fun and hugely informative. I hope you'll keep posting as your experience with this car unfolds and you learn more about it. Happy trails! Thanks lensjack! I'll be posting more as I get to drive the car more. And thanks for being along for the ride from the 2018's to the new 2019!! LOL. I must admit that the interior is simply B E A U T I F U L!! Congratulations. I too use the progressive screen a real improvement over the old fashioned dial look. The sport look is horrible in my opinion hate the yellow. As a european it is amazong to read the forum and see how cheap these cars are for you guys and how you can swap them so easily with little financial penalty. i have a 220d the bread and butter engine for europe and even a 350d will be a rarity given the hike in price for the car and the very heavy tax penalties. E43 and E63 are only for the seriously wealthy entering the 1% territory. Ok my car is well specced but i could seriously buy a house for what it costs! re the lte connectivity am still having issues here will update my thread later but interesting you are able to add to your cellphone plan. its a jour de fete for us here in france tomorrow shame you are in the usa otherwise you could have had a whole day with the new car(mind you it will be raining here in normandie&#128580 . Sorry it will be raining for your day tomorrow! Thanks for the kind words about the new ride. It's just a blast to drive. So the new Mercedes Me Connect app is thus far a total bust. They say I'm all registered correctly, but it just won't load all the myriad things it's supposed to load so now after a full day, it still doesn't do anything. A visit to the dealer this afternoon (more to pick up a bottle of wine my sales buy bought for us) and another round with the Concierge ladies and they were stumped. We got MBUSA involved and they say it will take a few days for it to load whatever bits and bytes it needs to be fully connected. We'll see if that's true. 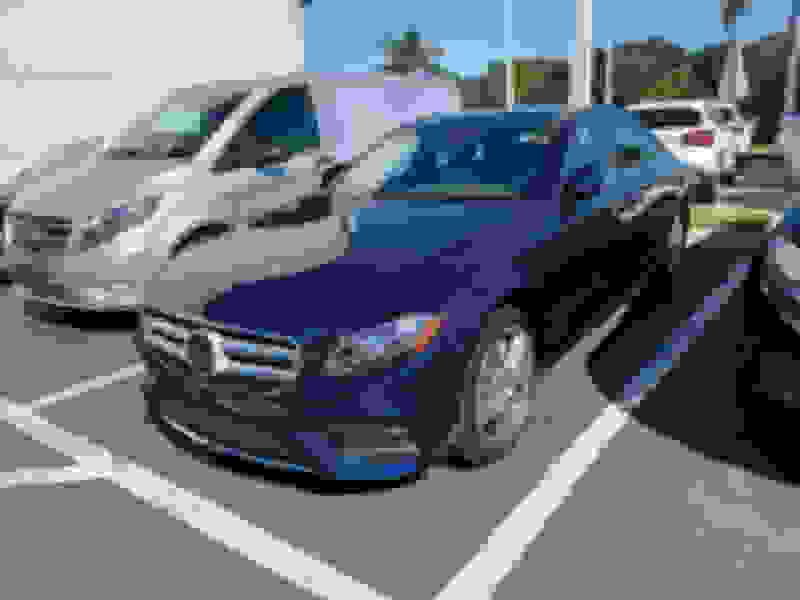 The only thing I ever really used Mercedes Me for was Send to Benz, as in sending addresses to the car in advance so they would already be ready to start navigation when I get in the car. This new Mercedes Me Connect thing is another level, but if it doesn't do anything, that level isn't much. 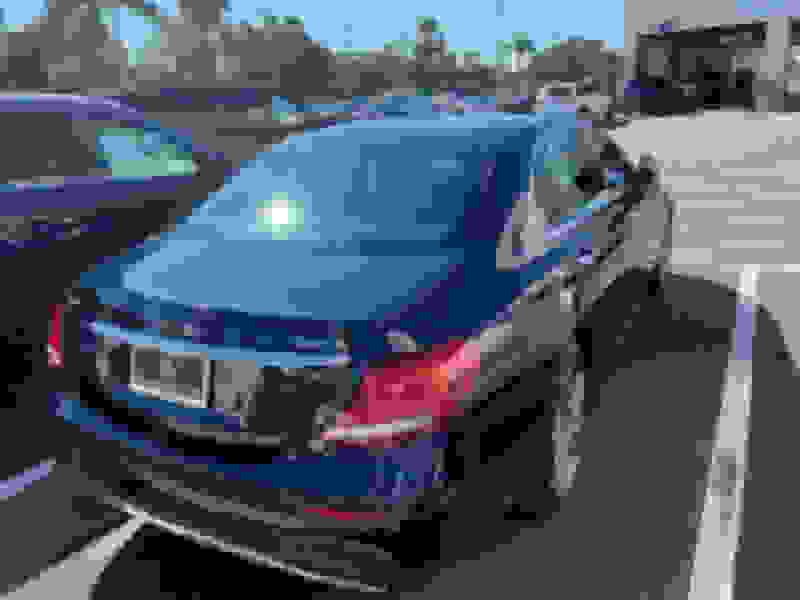 If anyone out there with a 2019 in the US with Mercedes Me Connect can comment on how it's working, if its working would be appreciated. Otherwise, this new car just continues to impress. It just feels so well engineered and the new engine is really a noticeable step up. Got my car today, love it, I'll start a thread with pictures about it soon. I think I do like your lighter natural brown ash wood trim better than my darker wood trim. I still really like mine, but I do think yours looks better, very nice combo. Mine is nice with the patterns and all and the zig zagging lines and who knows I may grow to like it more in time. My car was a in stock car otherwise I probably would have gone with natural brown ash. I woulda gone with the Air balance package too as I've liked that in my 2018, but just about no in stock cars have that stand alone option, it use to be part of the premium package. It's a shame, that was a nice feature. Infact I did not see one in stock car on the net that has that option. I miss the soft close doors too, there again stand alone option. Then again it's kinda nice to hear that vault like clunk when closing the door without that option. Hey, great to hear you got the car! Yes pics are mandatory and I look forward to seeing the wagon! On the Air Balance system, we had it on both the E300 and E400. For me, it wasn't something I would miss, so I didn't order it on the E450. I'd rather not have a system constantly squirting air freshener at me AND the space it took in the glove box was significant in a glove box that isn't all that big to begin with. So I'm happier without it than with it. I'm sure the wood in your car is beautiful. I don't think there's a MB wood that isn't really nice. Have you looked at the center console and the tap door for the charging mat and drink holder area? Notice how the wood markings are perfectly aligned with the center console wood. It was obviously cut from the same piece of wood initially. Pretty cool the attention to detail like that. I've never had soft close doors, so it's not something I could miss. And yes, the thunk is a great sound! Anyway, congrats on the car!!! For my 19 C300, I experienced much of the same thing...it seems that the app gave me a bit of run around constantly going through activations....but finally, it took and for me it's all set up. Even my sales advisor said that the set-up is a bit of a nightmare. If you've gone some days, though, and still not resolved there is definitely something else wrong. I THINK a lot of support people are stumped because it's new software, and I think it's far from being user friendly at least for the set-up. But keep at it---once you do have it set up, it is more useful than what we had before. Rod, your not the only one, I had a ***** of time getting it set up last night, it finally said to me that I needed to go to the Mercedes dealer with full credentials to prove who I was, then I called m brace and got the right tech who assisted me in setting it up properly. It is very tricky thats for sure. He verified who I was through my older version of the m brace app which I still have active for my 2018. They pretty much have changed everything and now are using ATT instead of Verizon. I'm just hoping they can finally get that remote parking pilot assist up and running soon, that would be very cool to park my car using my cell phone remotely, especially pulling it out of spots. I am disabled and need to get my door open wide to get into the car and sometimes people will park too close to my door to allow me to get into the car. With the remote parking assist I could back the car out of the spot using my cell phone. They already are able to use this function in Europe, not in the USA because apparently there was issues with the Verizon cell phone network not allowing this feature to work is what I heard, but even my 2018 is capable of doing this when the M Brace app allows it in the USA. 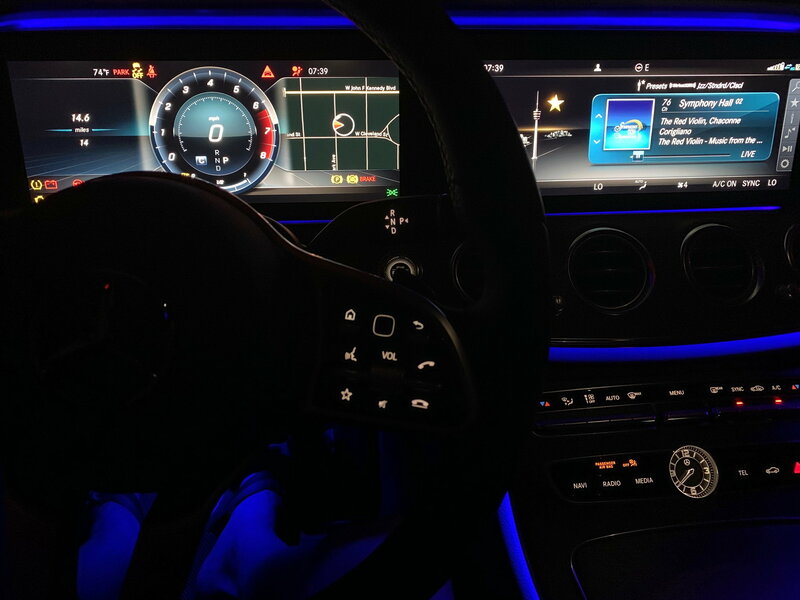 Have you been able to get your Mercedes Me Connect up and running? If you just got your car yesterday and you have, I certainly should be connected now on my 3rd day with my new car. I hope with AT&T we can get the remote park assist as well. I wouldn't use it very often, but there are times it would come in very handy indeed. I am interested to hear your opinion, after driving your E 450 for a few days, do you feel the extra power and torque, is the engine more responsive or feel like you have a stronger push at the mid range compare to your E 400? Yes, to all the above. I can definitely feel the difference and the car is simply more responsive than our E400 is. 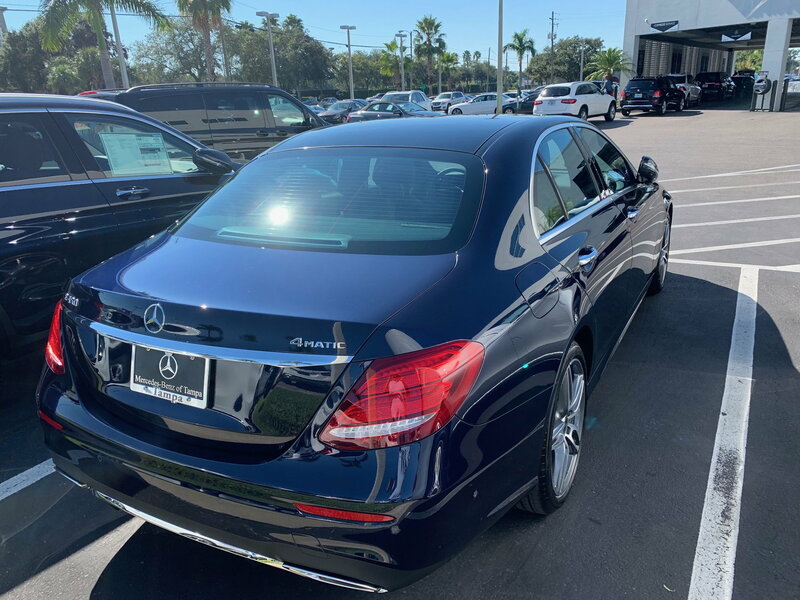 Don't get me wrong, the E400 is a GREAT car and I wouldn't trade out of it to get the 450, but this car is a nice step up. Still raining, so I haven't got my car yet. On the Mercedes ME connect. Am I correct in understanding that you have to have ATT as your phone service to get the remote parking pilot assist and other features to work? I surely hope that is not the case!! Sorry about the rain. About the Remote Park Assist, if you mean the one where you can start and move your car out of a parking space while you stand outside the car, that's not even available in the US. But no, you won't have to use AT&T as your cellular service. AT&T is the provider of internet service in your car. It's rumored (not proven) that it may be opened up to us in the future (near or far, not known), but you will absolutely need the internet service if you'll want to take advantage of that. If you mean the parking assist feature, which looks for parking spaces while you're driving slowly, then no, you won't need the AT&T internet package for that. I wanted the internet service so I can stream music via Apple Play and have full access to the internet on my phone and the phones of any passengers I may have with me as I don't have unlimited data on my cell plan so the AT&T plan for $20/month for unlimited data for up to 8 users is actually not a bad deal. Mercedes also has some apps you can access like Tidal Music, but if you don't have the internet package, I'm almost positive you won't be to access those apps. That said, since I seem to have offended you with what was intended to be a humorous reference, I tried to change the title of the thread, but it evidently won't let me. I was not offended by your use of the word. I'm actually more saddened by the over-sensitivity and lack of sense of humor these days. My automotive definition of Ricer (Rice Rocket, if you prefer) is about the severly moded Asian cars, NOT the drivers (who, as far as I have observed, are quite diverse). I felt your senior person humor.